Whether you're bringing home a new puppy or you have just adopted an adult dog, your new pet may need to be introduced to a leash. For some dogs, it may be as simple as snapping on the leash and heading out the door. Other dogs may struggle and appear fearful when you first show them the leash. For these pups, you'll want to introduce them to the leash slowly and do it in a positive way so they get used to this object that will be a big part of their lives. 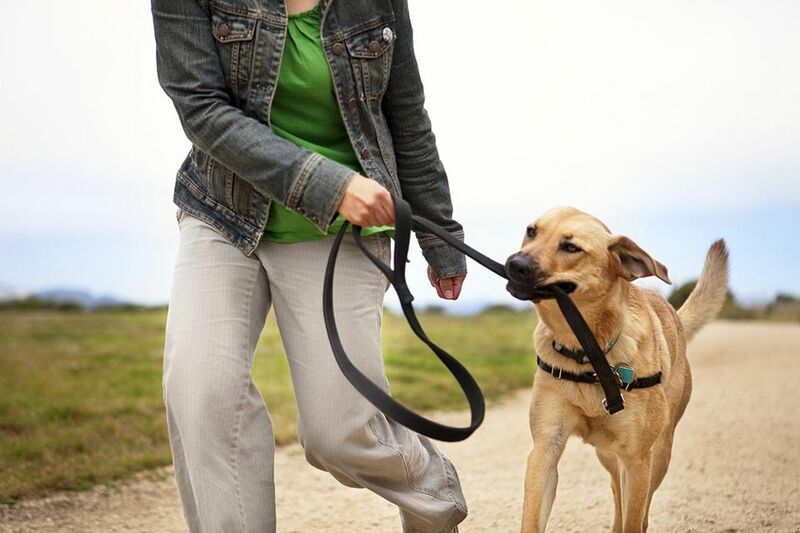 Rather than clipping on the dog's leash and heading out the door, give your dog time to get used to its leash. Start off indoors or in a fenced-in yard. Let your dog smell the leash then clip it on your dog's collar and let it go. Allow the dog to drag the leash around behind it and get used to having it attached to its collar. In the beginning, many dogs view the leash as just another toy. Don't let your dog get into the habit of chewing on the leash. Keep some of its favorite toys on hand to distract the pup instead. For instance, you can try throwing a ball for a game of fetch. This will get the dog used to the feel of the leash, but keep them from treating it like a chew toy. If you just can't seem to distract your dog from chewing on the leash, you may want to try putting an aversive on it. Grannick's Bitter Apple is a popular spray that many people use to deter unwanted chewing. Once your dog is comfortable having the leash attached to its collar, it's time for you to pick up the leash. Stay in the enclosed area, and simply hold the leash. You can call your dog to you, and give it some treats while you hold the leash. This isn't a lesson in walking on the leash, it is simply a way to get your dog used to you holding the other end of the leash. If the dog is pulling or struggling on the end of the leash, let it go and try again in a few minutes. It's important to remember that these exercises are meant to make your dog or puppy comfortable with the leash. Never pull on the leash to correct your dog's behavior. If your dog is pulling on the leash, you can drop it or you can try to use toys or treats as distractions. Since walking on a leash is an essential skill for a dog, it's important that your dog becomes comfortable on ​the leash as quickly as possible. Practice as often as possible for about 10 minutes each time. As soon as your dog is comfortable with having you hold the other end of its leash, you're ready to teach it to walk on a loose leash. It's important that you start this as soon as your dog's comfort level allows. You don't want it to get into the habit of pulling on the end of the leash. If you haven't introduced your puppy to its collar yet, make sure it's comfortable with that before moving onto the leash. The same rules apply to the collar when it comes to preventing it from becoming a chew toy. Correct your puppy with a simple "no" and offer a distraction whenever you notice it start to chew on the collar. They will quickly become used to it. During your training, be sure to maintain a positive attitude around your dog. Ideally, you want them to get excited whenever they see the leash. Over time, it will become associated with fun adventures like going for a walk or car ride, so establishing this happy connection early is important. Positive reinforcement is going to help your puppy accept the leash far faster than punishment. Be sure to have plenty of treats on hand and reward any good behaviors with lots of praise.